Another edition of the Ubuntu App Developer Week and another amazing knowledge sharing fest around everything related to application development in Ubuntu. Brought to you by a range of the best experts in the field, here's just a sample of the topics they talked about: App Developer Strategy, Bazaar, Bazaar Explorer, Launchpad, Python, Internationalization, Launchpad Translations, Unity, Unity 2D, Gedit Developer Plugins, the MyApps Portal, the App Review Board, the UbuntuSoftware Centre, Unity Mail, Launchpad Daily Builds, Ubuntu One APIs, Rapid App Development, Quickly, GooCanvas, PyGame, Unity Launcher, Vala, the App Developer Site, Indicators, Python Desktop Integration, Libgrip, Multitouch, Unity Lenses, Ubuntu One Files Integration, The Business Side of Apps, Go, Qt Quick... and more. Oh my! In his session, Jussi talked about one of the most interesting technologies where Ubuntu is leading the way in the open source world: multitouch. Walking the audience through the Grip Tutorial, he described how to add gesture support to existing applications based on GTK+ 3. He chose to focus on the higher layer of the uTouch stack, where he explained the concepts on which libgrip, the gesture library, is built upon, such as device types and subscriptions. After having explored in detail the code examples, he then revealed that in Oneiric Eye Of GNOME and Evince, Ubuntu's default image viewer and default PDF reader, will be gesture-enabled. Check out the session log. Another hands-on session from Michael, with a real world example on how to supercharge apps with cloud support. Using his experience in integrating the Ubuntu One Files API to Deja Dup, the default backup application in Ubuntu, he went in detail through the code of a simple program to talk to a user's personal Ubuntu One file storage area. We liked Michael's session so much that it will very soon be featured as a tutorial on developer.ubuntu.com! Check out the session log and Michael's awesome notes. Ubuntu directly benefits from Canonical becoming a sustainable business to support its development, and that's exactly what John talked about. Being responsible for business development in the Ubuntu Software Centre, he's got a privileged insight on how to make it happen. He started off explaining that the main goal is to present Ubuntu users with a large catalog of apps available for purchase, and then continued concentrating on how to submit paid applications to be published in the Software Centre. A simple 5-step process, the behind-the-scenes work can be summarized in: Canonical helps packaging the app, it hosts the app and provides the payment via pay.ubuntu.com, in a 80%/20% split. Other highlights include the facts that only non-DRM, non-licensed apps cannot be submitted right now, but there is ongoing work to implement license key support, and that MyApps, the online app submission portal, can take any nearly any content: apps with adverts, "free" online game clients and HTML5 apps. Gustavo's enthusiasm for Go, the new programming language created by Google shows every time you start a conversation with him on that topic. And it showed as well on this session, in which he created yet another "Hello world" application in a new language -you guessed-: Go. Along the way, he had time to describe all of the features of this new addition of the extensive family of programming languages: statically compiled with good reflection capabilities, structural typing, interfaces and more. 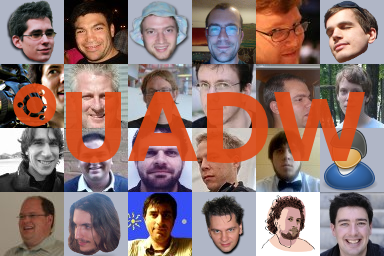 Finally, if you've got any feedback on UADW, on how to make it better, things you enjoyed or things you believe should be improved, your comments will be very appreciated and useful to tailor this event to your needs. Thanks a lot for participating. I hope you enjoyed it as much as I did, and see you again in 6 months time for another week full with app development goodness!